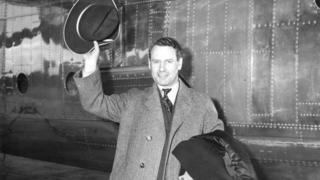 Artefacts collected by the diplomat son of the first Labour Prime Minister during his travels are going on public display. Malcolm MacDonald, son of Ramsey, was a renowned international negotiator, and avid collector of exotic objects. He amassed curios including a head-hunting sword from a Bornean chieftain and a Cambodian king's xylophone. The exhibit is on display at Durham University Oriental Museum until 14 January. There are also rare pieces of imperial Chinese ceramic art, including a Ding Ware bowl, of which Mr MacDonald wrote: "if I owned no other piece of Chinese porcelain, I should still be a proud and satisfied collector". This was the start of a highly-successful diplomatic career which included postings in South East Asia, and Africa. One of the high points was when he co-operated with the Soviet Union to chair an international summit which ended the civil war in Laos in 1962. Malcolm Macdonald followed in his father's footsteps as an MP and cabinet minister in the 1930s, and in 1941 was sent to Canada as British High Commissioner. Following his official retirement in the 1970s he became Chancellor of Durham University - where he was known as an unconventional character who might break up boring meetings by showing off his ability to walk on his hands. He also served as a top secret back-channel contact between Britain and communist China, capitalising on his personal friendship with Chinese leaders. Alexander Shaw, who helped set up the exhibition, said: "Malcolm was a collector with a strong social conscience. "This makes him quite a unique figure, one of whom Durham University can be proud to celebrate."